We explore the topic of lead generation and the complete process proven to deliver your business a significant increase in traction, lead quantity, lead quality and overall sales potential. B2B lead generation is essentially utilising different methods which can create business interest in your company. Lead generation is the result of your B2B marketing efforts at the top of the funnel - that is once the visibility has been created, awareness has been registered and access for contact has been made in some form. Generating new leads consistently is the decisive factor influencing the potential number of sales in the pipeline and this is the key to your business succeeding in a competitive market. It is important to maintain an advantage over your competitors with innovative and refreshing approaches to your B2B marketing strategy. But generating new leads is considered a major challenge to overcome for B2B marketers. Lead generation strategies come in all different shapes and sizes, through various creative and logical channels. Ultimately, it is intelligent business positioning. Placing your business where the audience is looking, for the best return on investment. Adopting the most effective strategy can be a frustrating and demanding task. It is a long process to perfect, but with the appropriate research, planning, techniques and tools, you can achieve the volume and quality of leads required to improve your sales results, meet your targets and grow as a business. With so many possible lead creation avenues available for you to experiment with, it is important to distinguish which is the optimum route for your business to take. Inbound marketing activity involves the use of digital channels to bring business directly to you through online presence, visibility and website access. The beauty of inbound marketing is that once you have created the ideal customer profiles whch you want to target and built a framework of each prospect's journey from Point A - all the way through your acquisition funnel, it is a largely automated process. When constructed with appropriate attention to detail, inbound marketing srategies can produce ectremely effective results in terms of scalability and have a positive return on investment for your business. You will need to keep your content updated throughout to maintain growth but it is a logical and practical way of being discovered and generating new business in the digital era. Outbound lead generation is still relevant, even with the developments of digital marketing. Because sometimes, nothing can beat the manual and direct approach of identifying businesses you believe are ideal customers and going out to them to make things happen. There can be a drawback with regards to the time and expenditure of outbound marketing, but it can also cut the confusion or technical difficulties often found with inbound strategies. However, both can be blended to create a strong dual marketing assault. There is no right or wrong answer as such when it comes to lead generation. It is all about what works at the time and allows progression and business development based on the context of your situation. Because the ever-changing world of business generally, and specifically, is fast-paced. Things which work at one stage may not so spectacularly further down the line. It can be overwhelming and complicated to manage a large number of campaigns at once. Try to order which lead generation processes you want to prioritise in terms of testing and determining the long-term potential of. Consequently, return on Investment is a key metric to build around. To understand this, lead scoring and qualification are both well-worth taking into serious consideration. Some lead gen strategies can provide quick-win situations, often spray and pray on a large scale, with less sustainability in the detail of the leads generated. But it may bring your business through a period of downtime in the moment and allow you to then plan more pragmatically going forward. Collate together the customer, industry and marketing information you know and can obtain, then get a clear picture of your budget for new campaigns. You can asses which options fit your time-scale and also which methods match the marketing skills your businesses has in resource. The following resource can be considered as an Ultimate B2B Lead Generation Handbook – and will help you in preparing your marketing strategy and ultimately instigate your lead generation. Content marketing is the perfect digital marketing platform for your business to be creative and establish its own personality and identity. Not only that, but it is an opportunity whereby you can achieve vast levels of visibility, build trust and authority in your business and assemble a solid foundation for leads. B2B Content Marketing can be aligned with your SEO strategy and will enable you to dominate search engine results and be found where your potential clients are looking. It is the perfect inbound solution. Content Marketing is material which gives you a reason to be seen and found by your audience. Not only will prospects be discovering you with absolute ease, but they will then begin trusting your advice as you gain authority and start that all-important customer-client relationship process. Content should be produced with the intention of engaging, educating and entertaining your potential readership of customers. If you take this into account when planning and preparing what you produce, you will never find yourself creating pointless or empty substance. Make sure that all of your content is coherent and pulls in the same direction to the pre-established goal. Remember that content marketing is a long-term lead generation strategy and you are unlikely to succeed without a detailed plan of action outlining the direction and intention of your content. It is important to document the plan going forward so that you have a benchmark to use and so that you can assess the eventual success of the campaign. Content around broad topics which you can use to help gain visibility and awareness of your business and brand. Attachment to articles, videos, infographics which offer value and build the framework of your brand identity. Advertising through giving knowledge, insight, enjoyment and assistance. Due to the nature of targeting ‘umbrella terms’, you will find traffic to content in this category will be greatest, but direct conversions at their lowest. This is because the wider subject areas reach more people, but of whom, not all are an ideal customer profile. But there are alternative advantages you must remember when putting time and resources into this style of content such as impacting your branded search terms, building your domain authority, gaining email subscribers and a social media following. All of this contributing to the overall funnel and for retargeting parameters, a way to disregard and qualify information about the audience you want to be driving towards. 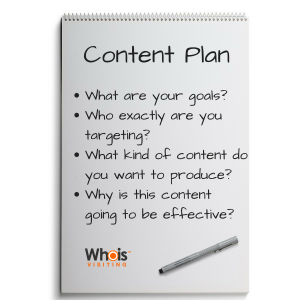 The second stage of your content marketing plan should be more aligned towards your industry specifically. Give away advice and tips to become the hub for legitimate industry information. And if your advice is trusted then your product and service will follow. You are no longer trying to gain the initial awareness by spraying content widely, but aligning more detailed content topics, drilling down with a bit more of a niche. Now you are becoming a genuine thought leader amongst the decision-makers in your remit. This can be extremely powerful. A quality blog or publication releasing frequent content that is in demand gives your business a massive opportunity to grow with effective exposure levels. This content category involves short-term, hard selling material. This is going to be found on your website for prospects at a different stage of the buyer cycle. They don’t want information about generics, or industry ‘tips and tricks’, they want to know why and how you can help their business get results in different ways which they can relate to. It could also be wise to take advantage of the low-volume, high conversion, SEO conversion pockets directly-related to your product or service. Creating landing pages for the specifications of each element with craft and engaging features. 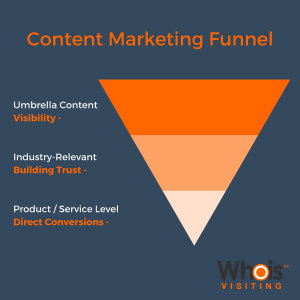 All stages of the funnel have their own purpose and have the potential to generate leads for your business - but some will be more direct than others. Have patience and trust in the process of the effects of good quality content and a funnel which ticks all of the boxes. The production of your content is not always straightforward. Even with a brilliant plan and ideas for the subjects of articles and videos, actually creating the content in its raw form is a challenge. If you do not have a specialist content writer, graphic designer or someone confident getting involved in creative projects, then it can be tough to compete with the level of quality which is being published by other businesses who possess superior budgets and creative assets. Another factor is the time which it takes to prepare and complete your content. This must be taken into consideration and weighed up in terms of the balance and therefore the opportunity cost of working on one campaign against doing something else. It may even need to be outsourced if this works for your business on a practical level. Be prepared, if you really want to generate leads consistently with content, you will need to release frequent updates and you must implement the strategy for this. The formality and tone of your content must be consistent throughout. It needs to match the personality of your brand and the environment you want to be associated with the business. This creates a familiarity and something which prospects can resonate with. You do not want to confuse them by sending out conflicting vibes and characters. It is not the end of the world if your content is not the most glamorous or functionally impressive. However, clean and well-structured presentation should be a minimum requirement if you want to see traction. Because this content is a direct representation of your brand and if its appearance is scruffy or unprofessional it reflects negatively on you as a whole - no matter how valuable the content actually is. So do not allow that to be a restriction to the potential impact of your article. Ensure the layout and spacing is tidy with no visual boundaries. It is amazing that you are now sitting on a content portfolio which has so much positive influence on your prospects and the potential to start generating awareness, brand trust and leads. But all of this means zero if it is not distributed accordingly, and effectively. All of these will contribute to the exposure of your content. The first thing you should do when completing any new content is run through a check-list of your circulation avenues and give your content the best chance to launch successfully. You are in effect, marketing your marketing material. Social media is an unbelievably wide-ranging area with so many platforms at your disposal to create ongoing lead generation opportunities. You must keep in mind that not all channels will be perfectly suitable for your industry and niche, so it is important to divide your time investment to each one accordingly. Understanding the nature of each social community is vital and often comes from experience and personal use. LinkedIn itself is a database for professionals so it should come as no surprise that it is a leading social media source for B2B leads. With regards to your approach when using LinkedIn, It is crucial to create a clear and respectable presence and make sure to be active. It is effectively the ‘Facebook of industry’ and you must transition your social formality with that in mind. There are many ways to get active on LinkedIn, which will include sharing relevant industry articles and news, interacting with other businesses and business leaders, connecting with new people and joining groups which could open doors to new leads and information. Let people know that you are there and ensure that you leave a good opinion of your business, what it stands for and what you can provide. An organic B2B marketing strategy on Facebook must be approached with the long-term in mind. Though the main aim is to generate leads, it is not an overnight procedure and will take time. Asserting a brand awareness by obtaining shares and interaction without the success of leads initially, is expected. Visual content on Facebook is key and most importantly your business’ Facebook profile needs to be there for access and information first and foremost. It is also important to have ‘call to actions’ visible on your page along with newsletter sign-up opportunities. The main lead generation impact from Facebook and your business will be from using the paid advertising tool. This again requires a targeting funnel and a lot of data collection to perform at an optimum level for cold prospecting. But retargeting will allow you to package ideal customer profiles, based on demographics who have interacted with your website and converted. You can also use this data to create lookalike lists for further promotion. The intelligent algorithms can really increase your presence and help you considerably to find new business with a respectable balance for a cost-per-lead. Twitter is a wonderful community for engaging closely with an audience. But you need to build that audience up firstly. You need to be extremely active and consistent to build your profile and again it is about finding a balance to leverage value and making users aware of your own purpose. One way to look at the impact of the Twitter followers you have gained is that they are captured in your funnel and they have a potential to see all posts from your account going forward. Surely you can produce one Tweet engaging enough to leave them wanting more information? Do not get caught up in the world of vanity marketing. Yes having a positive follower ratio can look impressive but if it doesn't transition into any goal completions, then it means absolutely zero. Worry less about the impression of your account and focus more on the production. A thousand, real, relevant and engaging followers is a far better situation than 20 thousand bots, spam accounts and zero potential leads. ‘Followers’ don’t pay your wages, sales do. Instagram is all about storytelling and displaying visually who you are and what you do. Again, it is not always going to be a sudden burst of lead generation, but with patience and quality, informative, entertaining images, you will succeed in leading through potential clients out of awareness. You can display your company culture which can have a psychological effect on people who view your account. Instagram is your chance to get into the minds of potential clients when the decision-makers are relaxing and not expecting to be interested in business-related matters. It is the planting of a seed. You can certainly have some fun with expressing your business across Instagram. Using hashtags in your industry and make an effort to interact with other accounts to build a buzz. That is the only way Instagram is going to work, if you are willing to buy into the nature of it. It is also a really good tool for running competitions which can blow up using hashtags categorising your post amongst the audience for what you want to achieve. Instagram also has numerous features you can optimise when you set-up a business account. You can link products directly into posts, place links in stories and pin specific information to your profile. The advertising platform is also linked to Facebook and this can drive direct traffic to your site. Quora is a form of social media which specialises in question and answer and you can utilise to discover, promote and analyse business topics with great detail. By searching for the related-keywords for your industry, you will automatically be presented with the questions which real, potential clients are having issues with, wanting advice on or seeking to understand more about. This is priceless data and allows you to get involved and be reactive. Educate the people who are sitting there waiting to be prospected, directly. Therefore you would not only be creating a visibility for potential leads who are also reading around the topic, but also a giving a solution and presenting yourself as an industry expert. It is very specific targeting, and you are able to view how many times your answer has been seen and evaluate its success with tracked links. Upvotes can also help to establish the success of that answer which you can gain organically through the help you have given others. Essentially you can take it as far as you would like, create your own business account or appear as an experienced professional in the field. But if people are asking questions that you have the answer to, then it is a monumental lead generation opportunity. You will never get anywhere on social media without a commitment to consistent activity and engagement. Try different things. There is no fundamental correct way. It is trial and error to discover what resonates effectively with your audience on different platforms. Content variation is crucial. Create a backlog of ideas and release them with the intention to track the reaction. Try to automate where possible. This will save you time and allow you to maximise your productivity to focus on alternative lead generation routes. Search Engine Optimization can be used in synchronization with your content strategy to rank higher in search engines, driving not only large volumes of sessions to your website but often pre-qualified visitors with high conversion potential. It is the most logical and powerful inbound marketing technique and capable of supercharging your lead generation when implemented accordingly. Keyword research is a fascinating procedure. And it is the first thing you must do when planning your SEO attack. Take into account everything closely related to your business and all of the information pages around it. Make a list of every possible search term related to your business and service. Begin prioritising them by search volume. You will need to gather an understanding of keyword competitiveness and how difficult it will be to rank amongst the posts on the first page. There will be some quick win opportunities which you can identify where the volume is high and the competition is lower. You will also want to target some more ambitious campaigns with extreme potential click-through rates. But ultimately it is a balance of the resources you have, and finding opportunities to create spikes of relevant website traffic. Content quality is essential for improving your search engine rank. Do not think you can simply bash together a basic page and insert a handful of keywords to position for a significant rank - certainly not if the keyword is saturated to any extent. Quality content, which is extensive, detailed and containing valuable features and imagery will certainly have better optimisation for capturing the search engine crawlers, giving you a chance of ranking more easily. It is best to identify the keyword targets for individual pages and not to have them overlap too much so that everything is focussed on that one page so that it stands out for that purpose. Remember to complete the ‘Alt (Alternative) text’ of your images for added optimisation. Heading optimisation, H1, H2, H3. Use of identifiable fonts - Bold, italic etc. These finer details all contribute to capturing attention for the keyword you are aiming to be the most authoritative source for. Include your keyword within the headline, first paragraph of the text, and create a steady density use throughout. However, there is no need to ‘keyword stuff’ and force the exact term into place where it is not natural. The search engine crawlers are insanely intelligent and will recognise terms which mean the same thing but are presented differently. So involve a variety of lexis and syntactical structures to account for this and gain the natural rank power. There can be a lot of fluffy romance shared when it comes to SEO. And yes, the quality level of your content is a significant factor, of course. But do not believe the hype of ‘great quality will always find its way to rank naturally’. Yes your content may eventually surface to a strong position over time, but the fact is if you want to start ranking quickly, you need a link-building strategy. Links are the currency of SEO. They are what contribute to domain authority and connect the networks which deliver the results. Domain authority is just a digital representation of how trusted your website is as a source. By having more links to your website and web pages, it increases the value of your online presence and displays an activity, relevance and trust. Therefore, having a higher domain authority gives you a better platform to rank pages from the starting point. And it is wise to implement a long-term strategy of building this through a range of link-building techniques. There are always ways to extend your inbound links and if you are putting yourself about and building positive relationships. Because if your brand as a whole is generating a positive perception then links will fall into place a lot more easily. All you have to remember is that the leverage is value. What are you providing to them which justifies a link placement? Once you have established a mutually beneficial situation then your link building is unstoppable. Be prepared to give something away for free to receive the longer-term benefits. Value - It helps you/ your customers/ your website. Leverage - This is in exchange for a link to our website/ web page. If this formula balances within the value you are giving then it is a no-brainer. So be creative within your niche and think - how can I be cheeky and clever to squeeze a link out of every communication. Because overall, every link is a bonus. Internal linking is also necessary to provide a clear structure to your website. Anchor text is also worth considering and using ‘Do-follow’ links. Webmaster tools allows you to see the Clicks, Click-Through-Rate, Impressions and Position for all queries and within locations and time frames. You can manage your campaigns with this data and see the progress in different contexts to highlight progress, areas of potential visibility and where can be improved. AhRefs is a brilliant, in-depth software for SEO analysis of your website and helps you in identifying opportunities through keyword research and content exploring. It is worth trialling and experimenting with. B2B lead generation software can enhance the number of opportunities which you have by providing business identification data of companies who have been on your website. Delivering you the practical information, in real-time, to turn a prospect into a genuine lead. A company visiting your website doesn’t become a sales lead until it is actioned or further contact is made. 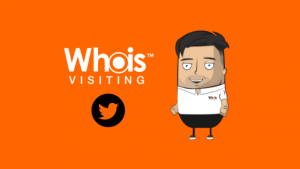 But website visitor tracking is a catalyst for this to develop in multiple ways by showing you the information of the pages a business has visited, the time spent looking at products or services and by giving you the email contact, office address and telephone number for the company. This puts you in control with regards to dictating an effective follow-up process specifically designed around their unique journey and particular interest in your business. It can be hard not to generate a lead when you know who they are, what they are interested in, how they arrived at your site and what their pain points might be. Implementing this software in an organised way, with automatic trigger alerting and reporting to the correct sales and marketing people will give your business the platform to generate more leads. Especially when combined with enhanced traffic delivery campaigns running consistently. The return on investment from Lead Generation software can be extremely positive when maximised to the full potential. Allowing you to run it alongside your Cost-Per-Click, Social Media campaigns, Content Marketing and Search Engine Optimisation projects to ensure that you can make the most of the expenditure and do not waste chances to convert anonymous businesses who have browsed and left your website - despite showing a genuine interest and having relevance. Even if your marketing department is firing on all cylinders, delivering a large volume of traffic to your website, presenting the opportunity for lead conversion, all of the good work can be undone if prospects arrive at your website and are left feeling uninspired and underwhelmed. Do not allow this final hurdle to be the barrier preventing the increased flow of leads into your business sales cycle. Aim for a web design template which is clean, engaging and progressive. The subconscious effects of including these will instil a confidence and trust in your brand, helping to grow the likeliness of conversion through professional appeal. Your website needs to be optimised for mobile and tablet devices or you are set to miss out on a large proportion of leads. It is also essential to consider the response time of your website as this will directly correlate to conversions. You must take the time to A/B test your website and web pages for a more complete result. Create as many designs as you want to and utilise the features which you have ideas about and run them all together. Over a sustained period, you will be able to analyse the results of each and filter out the elements which have not worked from some and ones which have for other and compile the ideal situation from across the samples. This is another trial and error approach and will take time to get right. However, it will be worth it in the long-run. It can open your eyes to finer details you had not anticipated taking effect or being useless. 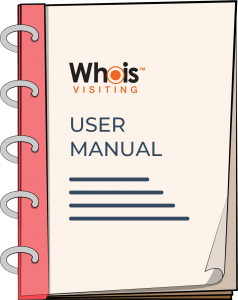 This software can provide a safety net or bonus lead bucket and give you another chance to convert website visitors through manual follow-up. Identifying the businesses who have visited your website but not converted. You can categorise these visitors and create specific trigger settings for qualifications which match what you consider to be ‘showing interest’ or a hot prospect. Website analytics gives you the ability to see the metrics of the campaigns you are running and analyse the success of the activity on your landing page. Although website analytics offer more quantitative than qualitative. Once you have been able to identify the pattern of who is being attracted and what is attracting them, you can enforce that specification in greater detail with more time or money behind it and continue to improve your lead generation results. Public relations - a construction of communications, media relationships, event marketing, creating your overall perception as a business. Your business public relations strategy can play a major role in lead generation success. PR activity can act as a platform to generate new exposure within the market through different contacts and opportunities gaining new awareness and visibility. Having other publications, professionals and businesses sharing positive information about you is far more authoritative, believable and effective than you saying it yourself through advertising. Creating relationships which influences the wider audience rather than ‘selling’’ to them. It is a more powerful technique in that sense. It is the perfect way to blend business and pleasure through the integration of socialising and building relationships which almost border on friendships with the right people. In 2018, the powerful influence which reviews can have on a business is significant. Every consumer or interested party will very much likely take to search engines or directly to trusted platforms and look for specific reviews from current or previous customers / clients. This can be applied to any industry, product or service type. People want reassurance and something to qualify their trust in developing their purchase. They want relatability and context around what they are paying for and how well their money is being spent. Comparisons, in every detail possible. You need to be aware of this and have an approach set in place for both delivering and managing reviews. Of course, ideally, if your service and quality speak for themselves and you deliver to an expected level or beyond. Setting the bar higher only makes it easier for you to then score anyway. If you have nothing to hide and you are genuinely doing business in the right manner, then the review community should do your lead generation prospects no hard but positive impact. But the internet has given a platform to everyone to voice an opinion and not everybody uses that to be nice. Hiding behind a computer screen, ‘keyboard warriors’ come alive. And any opportunity to expose or put down is often taken advantage of by trolls. It can keep you on your toes, especially if you pride yourselves on your service or specific quality detail. Because one bad review can tarnish so much good work. Because not everyone is leaving a review wants to be positive. You rarely go out of your way to be positive, because part of you expects good things as a minimum requirement. Alternatively, one slip up and a person can feel energised to share their poor experience. And the underlying damage can be quite severe. You can combat negative reviews. Reply and ask what was the issue more specifically. It shows activity, willingness to change and also rectify the situation. Working hard as a business and a marketing / sales team to instigate more positive reviews is also a great idea. Any customers who you have a strong rapport with or even newer ones who you feel have understood a good vibe and a positive relationship is developing. Ask for a review, send it in an email. Say that it is appreciated as we are working to build this, or change that. You can even incentivise to some extent. Or offer to link back to their site or produce your own review. There are always ways to ensure that you stand out in a good way amongst the reviews. People who think that cold calling in 2019 is not relevant would be wrong. Although the focus may have come off the process of cold calling, with so many automation and digital channels available for lead generation, there is still nothing like the practise of picking up the phone to a prospective business and literally exploring the opportunity to speak with the most appropriate person and running them through a brief overview. It is direct, instant and effective. But there are definitely levels to cold calling and the ‘temperature of approach’. If the prospect has a relevance then it is not freezing. If you have done business with competitors or similar companies. But it is a case of weighing up the tie of quality research against the activity of being on the phones. Finding a balance of this is crucial to finding results. Perfecting you cold calling pitch can take some trial and error. So be patient and learn from every conversation. Be prepared for every objection to return with an answer which leaves opportunities open-ended. Also ensuring that the company size is going to allow you to reach your ideal target, of which should have been identified as someone with authority and decision making power. Warm calling can allow you to begin the calling outreach at a later stage in the qualification funnel. For example calling a business that you know has been on your site, looked at a number of pages and returned. Also been looking at specific products for a long period of time and even viewed pricing or more details. This is a more productive use of time and you can expect a greater conversion rate. Paid advertising across social media and search engines really is an extremely powerful dynamic for enhanced lead generation. The complexity of the systems and the level of detail of data collected can contribute to amazingly appropriate messaging for an ideal profile. It offers large-scale potential with a reasonable cost per acquisition. Paid ads can be used for cold prospecting or to re-target your website visitors at different stages of the customer buying cycle. Re-targeting with online adverts is the fast-growing trend of constantly creating visibility in prime digital and social locations through perfectly optimised and positioned content packages based on the cookies of the website visitor. Designed with the intention of re-capturing the interest of a prospect who has been on a particular pathway or journey to and around your site. We all know that first-time conversion is not always practical. That is why re-targeting campaigns can provide you the automation to trigger deeper levels of engagement at more convenient times for the consumer. With it’s cost-per-click formatting or paying by impressions, you can control the balance to achieve an ideal return on investment. Creating the ideal re-targeting funnel is a complicated yet rewarding challenge. Understanding the mindsets and thought processes of those viewing each page, what information they need, want more of and what will be the key nugget that re-converts them to the site and even beyond that. Further to this, you need to consider where are you are sending them back go. You can’t allow a buyer cycle to take three steps forward but two-steps back. It is about progressing them to a deeper stage with an environment surrounding them that is optimised for conversion - based on the specific details you know about their actions and engagement. Email marketing is all about communicating through structured email to generate leads and establish a relationship with clients. It is wise when marketing through email that you do not treat everybody as one. Individualisation will be the start of a strong relationship, which is what you want to establish throughout your emails. Once a potential client can see that they are valued and more than just a number, they are far more likely to listen and take notice of what you have to say. Then, just as with your content marketing, you need to be sure that you are providing an email with a purpose which is going to help, inform and captivate. Your email timing is important as is your patience and persistence. Not everybody is going to become a guaranteed lead from one, two or three emails. You must keep at it and keep providing variable content and information until you eventually succeed and make that breakthrough. Cold emailing is still a wonderful way to present information in front of people in a mass scale and in a professionally-constructed manner. It is an exposure gateway which has so much potential if you can build a campaign which goes hand-in-hand with your industry targets. Cadence structure and content is always a difficult challenge to get right when planning an email campaign. Everybody seeks the perfect answer, which is guaranteed results - like some kind of magic potion or formula. But it doesn’t really work like that. It is a matter of timing, circumstance, research and logical matching. You can experiment with subject lines, content inclusions, copy length etc. But the main thing to remember is that like any other prospecting communication process, you need to offer actual value and you can only put that information as clearly as possible in front of the best-qualified profiles. Email Automation - you can automate your follow-up process and simply action the responses which come in across the course of the campaign whilst getting on with other lead generation tasks. Practicality for sender and receiver - email allows the receiver to respond with no pressure or expectation to do-so immediately. This means they can come back to you down the line when the timing is better. Content outreach platform - a way to share further materials and information of value. High chance of digestion - this gives you a chance, if nothing else. Cost-per-lead - the scale of email marketing and the cost of services means it is a small expense for acquisition. Email address data access - you can find data which is more ideal for your exact target, improving the qualification of your outreach. If you can identify strategic partnerships which are mutually-beneficial and align with your own branding and market positioning, it can be a strong lead generation avenue. Depending on what stage your business is at and the finer details of your industry, teaming with a business who has a similar audience but is not a direct competitor is a good way to gain exposure and create cohesive momentum. It can add an authority to your brand and also create a contextual perspective from the eye of the consumer looking to justify their decision to commit to your product or service over another. Understand your position in contrast to the partner in question. Find a leverage which is appealing for them. Let us explore the option of Webinars for B2B Lead Generation. Webinars are a form of video marketing which allows businesses to communicate very directly with prospects. They provide a platform for specific information and question and answer sessions which create such a strong opportunity for conversion of webinars is different. You are only going to have strong-qualified leads present. Therefore the levels change. The technical detail and the attention to individual prospects and businesses can be greater. They are an excellent representation for your business. Going out of the way to arrange frequent webinars is appreciated. But for your own business benefit, they are extremely practical in the sense you can save time by inviting people to your webinar rather than arranging individual demonstrations or meetings with all attendees. But to have a successful webinar you need to access relevant people and market it in an appealing way. Giving away secret information is a brilliant pull to get more numbers to your webinar. From here it is all about the quality and value of the content and the personality of the host. Being fully prepared for the range of questions is also crucial. Having the answer to the difficult queries from the audience can be the difference between generating leads from the webinar, or not.